IF YOU EVER HAD CHICKENPOX, the bugs that caused it remain in your system for life. However, if you’re lucky, you’ll never really know they are there, hiding out. That’s if you’re lucky. Unfortunately though, about a third of us will at some time in life be reacquainted with the nasty devils – in the form of shingles. No one knows for sure exactly what reactivates them. Stress is often said to play a role. If so, what kind of stress? From what I can gather, practically any kind: physical, emotional, even having the flu. And it can strike at any time, though vulnerability increases with age. So about one in three of all adults, mostly otherwise healthy, will get shingles during their lifetimes, usually after age 50. Since the incidence increases with age, it is 10 times more likely to occur in adults over 60 than in children under 10. And a measure of severity of pain is said to double among people over 70 as compared to those 60 to 69 years old. A vaccination can reduce your risk of getting shingles, but it is not a 100% guarantee you will be immune. I was vaccinated and it got me anyway. Nevertheless, put the odds in your favor. Get the shot. It is also claimed that vaccinated sufferers have less severe experiences. In mid-June, 2014, I noticed a light headache at and just above my left eye. Over the next three days my eye itself became irritated and I also felt a tingling sensation that ran from my eyebrow and forehead to up above hairline. I made an appointment with my primary care doctor who sent me to an ophthalmologist. 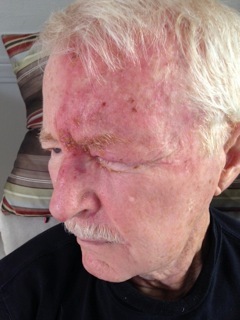 He diagnosed it as a stye and prescribed an eye salve. I went back a day or so later when the pain got worse and blisters started forming on my forehead and around my eye. He told me I had shingles and prescribed an antiviral medication to be taken over the next five days. He said he’d see me again in one week. During the first week the blisters fully formed on the left side of my face, at eye level, and into my scalp to the top of my head (see photo). The pain was intense and unrelenting, a burning sensation, as if my face were on fire, plus a throbbing headache and eye pain. My wife applied hot and cold compresses. Still the pain was so bad that I paced the floors at night because I could not sleep. My next appointment with the doctor was early in the second week and the blisters had started to crust over and fall off. He said I had about another week to go and then I’d be fine. I told him the pain was excruciating. He prescribed the painkiller Vicodin (which turned out to be like using a BB gun to bring down a grizzly bear). He said there was no need for another appointment. “Just tough it out,” he added. My wife is a schoolteacher and her principal told her that when she had shingles a local acupuncturist helped her deal with the pain. We made an appointment. The second week had passed, and, except for a swollen eye, my face now looked almost normal. I had five sessions with the acupuncturist. He said my doctor should have me on something called gabapentin. The acupressure and acupuncture points he hit relaxed me and I felt pain relief while there, but it was short-lived after I left. Patty called my primary care doctor. By now about three weeks had passed since the shingles diagnosis. Right away, my primary doctor prescribed gabapentin (the acupuncturist was right) and oxycodone. She set me up with a different ophthalmologist and also a neurologist. Taking the gabapentin and oxycodone provided enough pain relief that I could, at last, sleep at night . . . and through most of the day. The meds made me drowsy and dopy. But that was okay with me: anything to escape the pain. Now we were no longer dealing with actual shingles but something called “post herpetic neuralgia,” or PHN. PHN sometimes follows shingles, especially in the elderly or younger people with compromised immune systems. It is intense pain often described as burning, stabbing, or gnawing. Affected areas of your body may be hypersensitive or may have decreased sensation. Enter the neurologist. My wonderful wife had never complained about nightly awakenings to apply hot compresses and dispense meds. But the neurologist prescribed a time-released kind of gabapentin called Gralise (it’s expensive and regular gabapentin isn’t) that you take only once a day. I found that now I could sleep, mostly pain free, through the night, and Patty could get uninterrupted sleep too. I stopped taking the oxycodone, which was great when the pain was intense. But it is a narcotic that can be habit forming. As I write this today, I’m entering the third month since diagnosis. Vision in my left eye is not quite back to normal but seems to be getting there. I’m still taking Gralise. From time to time, I still get minor eye and forehead pain. However, it doesn’t last long. I have no feeling on my eyelid and along my eyebrow, and the skin above to my hairline feels like leather to the touch. I’m told it may gradually return to normal, or maybe not. But I look like my normal self. Once daily, I apply Topricin, a Homeopathic therapy foot cream – yes, foot cream – my wife learned about from a masseuse. It was a godsend in relieving itching I sometimes experienced at night when things were tough. Finally, not all shingles sufferers experience the lengthy ordeal of a PHN aftermath. On the other hand, for those less fortunate, PHN can go on even a lot longer than mine did. Yet anybody who has had shingles, regardless of its length, will tell you it is a miserable experience. Improve your odds of avoidance: get vaccinated. Should you ever think an attack is starting, get to the doctor right away. Taking the five-day antiviral meds as quickly as possible is important. Also be lucky enough to have a spouse, friend or significant other to help you out - unless you’re a whole lot tougher than I am.